Quick Update: Everything on the first floor of the house is now covered with a fine layer of drywall dust, but we have walls again in the kitchen! Barring any unforeseen circumstances, flooring installation commences today, (only a week late) so keep your fingers crossed. While Bob worked on the kitchen, I changed out the hard drive in our pc and worked on installing software and files all day (it literally took all day). So, in the midst of the craziness this weekend, and while the computer was thinking, I took refuge in front of the sewing machine. Along with finishing the last of my Christmas gifts, and working on a customer quilt, I worked on my Buffalo Ridge blocks for a block exchange. I'm making three of each block and exchanging with a couple of friends. Now I'm working on a gaggle of Flying Geese to exchange with the blocks. They'll end up in a quilt someday. I just think they're fun. 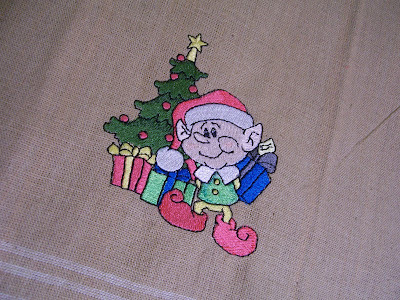 I'm not so sure about Santa with a blond beard, I think I'll have to re-stitch him? This little guy I put on a kitchen dish towel. I have a bunch of these towels that I picked up on sale, so I may do more of them with different characters, they made me smile. Lately I've been getting some knitted projects finished for the holidays. I've been making scarves. I won't say who they are for, just in case they happen to drop by my blog. The wool for the first one was just beautiful, I loved working with it and seeing how it knitted out with the color changes. This one is knitted in the same pattern as the first, but with the solid color you see the zig zag pattern much more distinctly. This one is so soft, made with a blend of Marino wool and cashmere. I'm getting quite a stash of yarns, and I'm finding that half the fun of knitting is experimenting with the different colors and fibers and being thrilled with the outcome. Well this weekend I've had quite an adventure with our computers. First, for no apparent reason, our hard drive died on our desktop PC, then today my Mac laptop decided to have some kind of flashy multicolored psychotic episode. After spending an hour on the phone with a very nice lady in India, we decided that the HP hard drive couldn't be saved and it was in fact under warranty, so they are mailing us a new hard drive. Then, later today a visit to the Apple store did result in a fix for the Mac thank goodness, and it did not have to be institutionalized. But as a result of all of these electronic eccentricities, I've decided to just pop on with this quick little post, and then spend the rest of the evening with needle and thread, and nothing that does any computing what so ever! 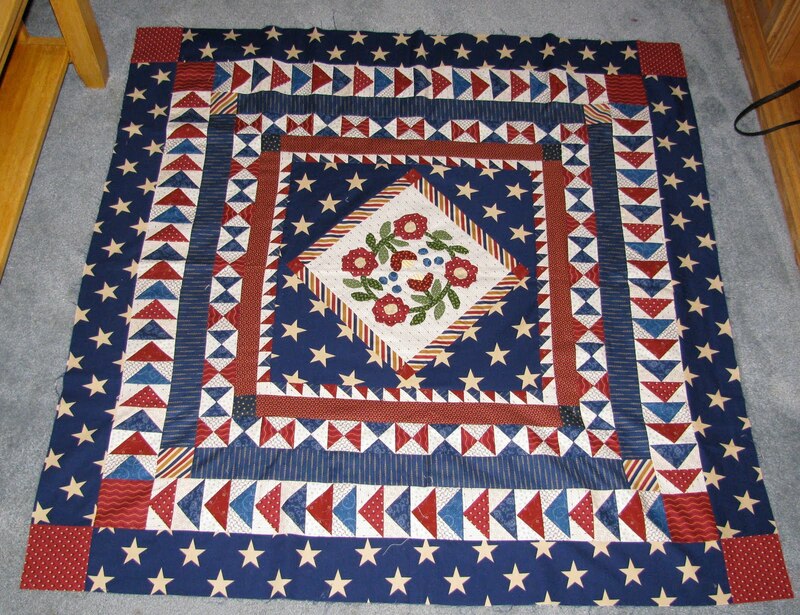 So for your viewing pleasure, above is a Patriotic version of Jo Morton's Holiday Inn quilt made by Chrys Rose. 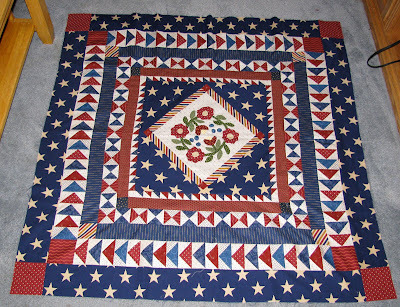 I just love Patriotic themed quilts, and this one blew me away. Chrys was kind enough to let me share it with you, along with her great blog called Paper Roses where she does some beautiful paper art. 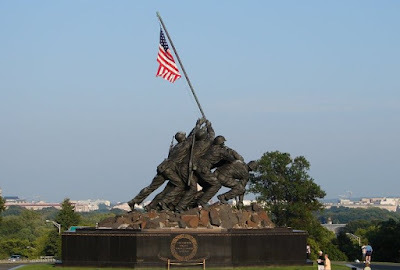 You can view her complete post with the Patriotic Holiday Inn by clicking here. Our Jo Morton Club met last night and everyone had a treat to show and tell. More Warm Wishes components are coming through ~ the above hand appliqued center is Peggy Schaum's, I love the Crimson and Clover line that she through in. And the Warm Wishes blocks are coming together. I think these were Denise Erdle's (I've lost track, I know Peggy had her red blocks there too). This beauty is from Sheri Thompson. It was from Jo's Little Women Club 7 (I think it was called Somerset). Sheri quilted it with a beautiful allover feathery design. Then we got to enjoy some baskets. This little one was also from JLW Club 8. Dawn Burchet machine quilted this one, and added the feathered wreaths with her embroidery machine. These basket buttons that Dawn found are just adorable on this little quilt. Val Sanford shared this beautiful basket quilt that she made from a Fig Tree Quilts pattern and fabric line. It just made you say, "Ahh" when she opened it up! Our Jo Club won't meet in December, but will be gearing up to start Club 9 in January! Our Thimbleberrie's Club meeting was last Thursday, and I'm just now getting the pictures uploaded to my computer ~ wow, life is moving too fast, can someone slow the ride down a little? Sheri Thompson of Pieceful Completion Quilting brought in some of the quilts that she has recently quilted on her long arm for us to ooh and ahh over (and we did). The all over design on this yellow and blue quilt was just gorgeous, but unfortunately it doesn't show up well in my photograph, so you'll have to just take my word for it. And there was this past Christmas project that we think was a Thimbleberries pattern ~ I haven't had the time to research it in my Thimbleberries library, but it sure has that comfy Thimbleberries feel. Jan Thomas brought in her House quilt from Thimbleberries Club 2007 just back from the quilter. Many of us in the group still have this one as a PiP (project in progress), so it was a real treat to see it all finished. My hubby's birthday was yesterday and I wanted to have this quilt (that I've been working on forever) all quilted up for him. I quilted on it all week, and got it finished by Friday. The quilting doesn't show up much on the front, but on the back it can be seen better. I used this grey flannel from Jo Morton's Star Gazing flannels collection for the backing to make it a nice cuddly throw. Of course I am finding that every dog hair in our living room clings to it ~ maybe that will make it even warmer?? This is what we worked on this weekend. The wallboard was removed to add more outlets and move the phone and cable hookups. New lighting is being installed. Next we move on to reinstalling the wall and patching holes. Pretty ugly, but definite progress is being made! And on the business side of things, today I was featured on the Quilt Patterns 4 Sale Blog! Click here to see Pam's kind words about some of my patterns :) She has a new website that she's started QuiltPatterns4Sale.com, and I'm on it along with some other talented ladies. It made my day! Quilt Shopping and Better Yet ~ A Sale! The Quiltsy Team on Etsy is having a special team promotion November 13 - 20th and all participating shops are having at least 10% off. Quilted items in my store are 20% off this week! (These are a few of my items). Shopping these Etsy stores is like enjoying a quilt show. There are beautiful finished quilts, and then some shops have fabric for sale! Have you heard of Leah Day of Day Style Designs yet? 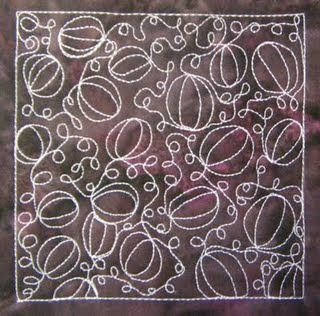 I found her blog called 365 Days of Free Motion Quilting Filler Designs and it's fantastic! Every day she shares tutorials on how to do a different free motion design on a regular sit down sewing machine using great photos and videos. On the blog you can sign up for her free newsletter with updates on the quilting designs featured for that week. 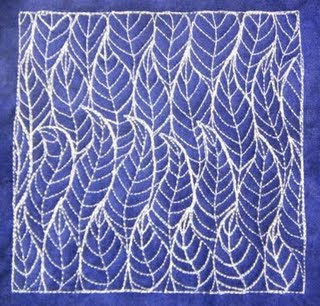 This link on her website has a cornucopia of quilting articles and video demonstrations, and just her Frequently asked Questions page is worth the cost of admission :) Check it all out, it is well worth the time. I have been busy sewing lately, but unfortunately can't show any of it because I've been finishing up some Christmas gifts, and Santa wouldn't be happy with me if I blew the surprises. But since tonight is Thimbleberries Club, and I'm in the Chirstmas Spirit, I made this little quilted gift bag from a Thimbleberries free pattern...just for fun. So outside we went for a little fun in the sun. 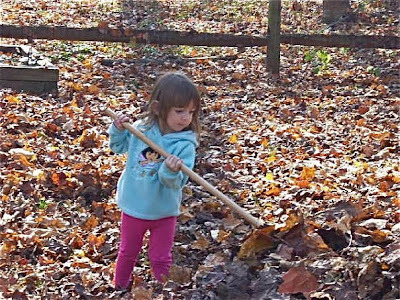 Everyone wanted to pitch in, but some of the tools were not quite right. So the real worked commenced. Even the dogs got tuckered out. Then back inside, Elsie decided that one of my packed up bins of kitchen items looked comfy.